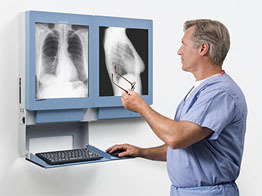 MediPort by MAXANT Technologies is the next-generation in medical imaging display. MediPort answers compelling and previously unaddressed needs of diagnostic imaging: the need to incorporate diagnostic imaging into normal clinical or diagnostic review processes, and the need to embrace medical and information technology while conserving space. MediPort facilitates an easy transition from analog to digital. It can be combined with MAXANT Tech Line Illuminators to become a complete digital/analog workstation. MediPort can accommodate up to three displays available in 1.3 to 2 MP color or 3 MP grayscale. Thus serving as either a comprehensive clinical review station or a diagnostic workstation. • Designed and manufactured for digital medical applications. • Space-saving construction frees up counter space and takes up no more space than an illuminator. ONLY 3.8 inches thick! • Integrated digital imaging/analog illuminator systems option. • Choice of wall-mount or recess-mount. 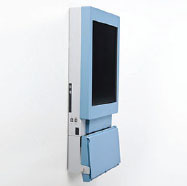 • Configurations available include - clinical review station or primary diagnostic work station. • Mounting hardware included for wall-mount system. • Direct wall replacement for MAXANT & other film viewers no additional wall space needed. • Only MediPort offers a choice of wall surface or recess mounted, desktop or mobile cart. • Commercial grade for private practice and Medical grade: suited for use in isolated power systems such as in an OR, ER, ICU, CCU and other medical applications. • Features a pop-up keyboard and mouse shelf for easy operation. • Can be configured to serve as a clinical review or primary diagnostic workstation. • No change required in workflow or interaction with patients. • Offers integrated digital display and analog film view option. ClassicXray has configured a couple of the most common Mediports to order online below. The Private Practice model 3000GP-A with commercial grade electronics and the Large Clinic or Hospital model 3200-BB with medical grade electronics. Tired of trying to load DVD's on your office computer and it crashing? Look no further! 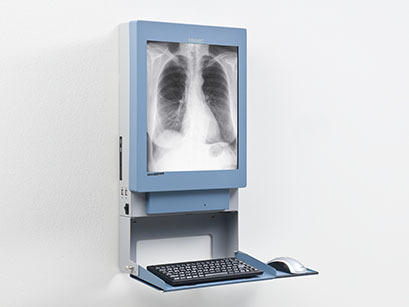 The Maxant MediPort 3000GP-A is an All-In-One, integrated Monitor and CPU workstation in a standard x-ray viewer footprint. This unit is designed for private practice and workflow efficiency. MediPort 3000GP workstations are Commercial Grade and meet the stringent UL 60950 Standards. 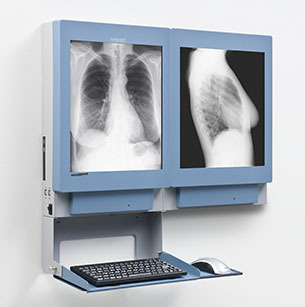 The Maxant MediPort 3200 is an All-In-One, integrated Dual Display Monitor and CPU workstation solution in a standard x-ray viewer footprint. Designed for space and workflow efficiency, the MediPort 3200 can be either surface wall or recess mounted. All MediPort 3200 workstations are Medical Grade and safe to be installed in any patient area care or surgical environment. It meets the stringent UL 60601 Hospital Standards and has 501(k) clearance from the FDA as a Medical Device.